The story of doll manufacturer Waltershauser Puppenmanufaktur GmbH ("Waltershauser") is a long and distinguished story, beginning in 1810. In 1810, Johann Daniel Kestner (founder of the famous German Kestner doll firm) chose the Thuringian town Waltershausen as the location of his doll factory. The story continues with the equally famous doll firm of Kammer and Reinhardt which came to occupy that same factory in the late 1880s. In the early 1990s, after the wall came down which separated East and West Germany, Verena Hackenbruch, a business women from West Germany who loved dolls, bought the remnants of the Kestner and Kammer and Reinhardt companies, including the original factory. Ms. Hachenbruch decided to bring fine dollmaking back to Waltershauser, and to do this she relied on the wealth of dollmaking expertise still available in the Thuringia region. Additionally, she hired some of the best-known doll artists including Hildegard Günzel, Vera Scholz, Jutta Kissling, and Karin Schmidt to create dolls for the firm. The motto "Only The Best Is Good Enough" was carved in stone over the gates of the Kammer and Reinhardt doll company in 1907, and that motto continues to be the motto for the modern Waltershauser company today. Many of the dolls created by the Waltershauser modern doll artists are made in Biggidur®. Biggidur® was created by the Waltershauser company, and it is a very interesting material for dollmaking--it seems to be distantly related to the composition material used for the antique bisque-head doll bodies, including dolls made by both Kestner and Kammer and Reinhardt. It is hard to imagine Biggidur® unless you have felt the material. The material is lighter than both porcelain and composition, and somewhat reminiscent of papier mache, except that the material is harder, smoother and sturdier than papier mache. The material is warm to the touch, not cold like porcelain. Many of the dolls have bodies of this material. The company describes this material as a "bridge between vinyl and porcelain" that gives the doll the feeling of "real skin" but they closely guard the secret of exactly how Biggidur® is made. The company also points out that Biggidur® has no pores and it doesn't break. Just as in porcelain produced dolls, hand-blown glass eyes are fitted from behind and secured with plaster (with a vinyl doll, the eyes are inserted from the front of the doll into expanded eye sockets, or sometimes glued from behind). Each doll produced by Waltershauser is individually hand-painted, and not produced from a template. Carolina Barksdale, the Vice President of Waltershauser, has told me that the company is very proud that the facility which is used by Waltershauser to produce the modern dolls is the same factory that produced both K & R and Kestner dolls. She said that the added benefit of this is that at the location of the factory there still lived families that had several generations of family members in the dollmaking business, including grandparents that had worked at the original factory. Some of these people have passed on to Waltershauser original methods of eye painting and doll assembly. Every aspect of the dolls, from making the porcelain to body assembly, to wigging and costuming, are done in the factory in Germany. Waltershauser works with both American and German doll designers, including Vera Scholz, Hildegard Gunzel, Jutta Kissling, Marlis Knoll, Gabriele Muller and Berdine Creedy. Berdine Creedy is one of the well-known artists that has her dolls produced in vinyl and Biggidur® by Waltershauser. Berdine couldn't be more thrilled by the collaboration. When Waltershauser approached Berdine Creedy last year about manufacturing some of her dolls, Berdine was very interested! She couldn't think of a better company to beautifully manufacture some of her dolls and bring them to a wider audience. If Berdine was choosing a company herself she said that Waltershauser would "have been her top choice." Berdine is especially impressed by the way Waltershauser pays attention to small details, and by the materials that Waltershauser chooses to make the dolls "everything is the best, from crystal hand-blown glass eyes to real silk and human hair," says Berdine. Berdine also likes the low numbers of their limited editions. Another artist who produces dolls for Waltershauser is Vera Scholz. Vera is from the suburbs of Hamburg, Germany, and she has been with the company since its re-introduction in 1994. Vera's dolls, including the heads, are often made of Biggidur®--some of Vera's dolls even have Biggidur® bodies with 13 joints. Hildegard Gunzel is one of the best-known German dollmakers. Ms. Gunzel has been making dolls for 30 years. Even though she has established her own doll manufacturing company, she still chooses to also work with Waltershauser. In addition to the original artist dolls that Waltershauser produces, Waltershauser has also recently commenced production of Kestner and Kammer and Reinhardt reproduction dolls in porcelain. The company claims to be "the only doll manufacturers in the world who possess the ability to duplicate the original manufacturing process through the use of white porcelain as the basic material." The reproductions are handled by a branch of the Waltershauser company called "WPM Atelier K & R. Studios." Each of these dolls are hand-signed by the artist before they leave the studios. The hand-blown glass eyes are produced in Lauscha. 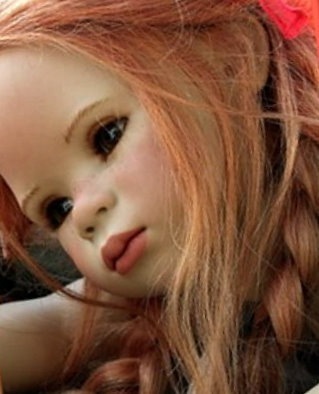 The wigs are made from human hair or mohair, which are appropriate to the antique dolls. And, natural, appropriate materials are used for the doll clothing. Many of these dolls are strictly limited; some being produced in editions of only 200 dolls. Dolls being reproduced include K & R's Mein Leibling, K & R's #115, K & R's Peter and Marie, Kestner's Hilda, the Kestner AT doll, Kestner #208. Many original patterns and forms are used in the production of the dolls. The dolls sell for several hundred dollars each, far below the price of several thousand dollars each that the original antique dolls sell for today. All Waltershauser dolls, both artist dolls and reproduction antique dolls are limited. The number of heads for each doll produced is limited, as well as the number of style of a type of doll that is produced. So, a Waltershauser designation of 2/250/750 would be the second doll of an edition of 250 of dolls of this type from a total distribution of 750 dolls with this head. There have been dolls from Waltershausen, the northern gateway to the Thuringian forest, since as early as 1815. There are records to show that Johann Daniel Kestner jun., whose firm after all employed 1264 people in 1846, manufactured dolls' heads and bodies from that time on. There have been more than 50 firms of various sizes here in Waltershausen since that time. The Schloss Tenneberg Museum houses a collection of the world-famous Waltershausen dolls with jointed limbs and individual personalities, which were considered to be the most beautiful at the turn of the 19th to 20th century as well as dolls from all over the world. From 1929 onwards there may at first have been a relatively modest doll collection on display but since then the collections have grown incredibly. A large proportion is on display in the castle. Although the Waltershausen dolls may have passed their heyday the museum nevertheless receives an incredible amount of attention as evidenced by the many interesting dolls donated between 1997 and 2005. At present the museum displays a great variety of dolls, which were produced between 1835 and 2001. Extensive information in words and pictures make the exhibitions a well of information for anyone interested in dolls. Further permanent and temporary exhibitions are planned. Biggidur is a high-quality material which is not particularly easy to work with. For example, it must be stored and allowed to dry for at least 6 months before it can be painted and further worked on. Biggidur gives their dolls that velvety soft expression reminiscent of particularly delicate skin. The surface, similar to porcelain, and the detailed finish, ensure that WPM creations have a life-like expression of a quality not previously achieved, and a natural look which is unrivalled. Superior features such as high quality glass-blow eyes inserted with wax and plaster, human hair wigs, lavish designer outfits made from top-of-the-line materials such as silk, wool, cashmere, cotton, etc. and leather shoes which are specially made for each doll emphasize the worth and quality of their dolls which have been in existence for almost 200 years! Последний раз редактировалось Матильда 04 апр 2011, 15:06, всего редактировалось 4 раза. Меня часто спрашивают , кто моя самая любимая кукла . Люблю всех , но самая особенная для меня - Юта . Последний раз редактировалось Матильда 15 авг 2012, 16:31, всего редактировалось 2 раза. Последний раз редактировалось Матильда 15 авг 2012, 16:39, всего редактировалось 2 раза. Матильда, вот это скорость. Аплодисменты от восхищенных зрителей. Куклы - бесподобны. Ура!!! Наконец-то тема открыта!!! Спасибо Матильда!!! А что за милый ребенок на последней фотографии? Просто чудо,какой хорошенький! Милая девочка с удивленно-любопытным взглядом,просто живой ребенок!!! Я просто влюбилась в нее!!! Последний раз редактировалось Матильда 15 авг 2012, 16:37, всего редактировалось 2 раза. Последний раз редактировалось Матильда 15 авг 2012, 16:42, всего редактировалось 2 раза. Последний раз редактировалось Матильда 15 авг 2012, 16:49, всего редактировалось 2 раза. Ну, наконец-то отдельная темка для очень достойных кукол! Спасибо! Последний раз редактировалось mariann 03 апр 2011, 10:03, всего редактировалось 4 раза. Прекрасные! И такие разные.... Любуюсь и восхищаюсь! Спасибо огромное за фото красоты!! Лена, вставайте ! А Ваши фото ? Матильда, спасибо большое за открытие темы! "Теорию" буду ждать с нетерпением! Матильда, спасибо! Здорово! Что остаётся сказать? "Во всех ты, душенька, нарядах хороша!" ...Только у нас куколка за долгие годы где-то утерялась... Хотя во всём остальном - идеальная девочка! Аристократических корней... На фоне остальных это здорово заметно. И ещё: в 1997 у неё, по-моему, волосы лучше, у моей - просто шикарные! Матильда писал(а): Лена, вставайте ! А Ваши фото ? Матильда писал(а): Меня часто спрашивают , кто моя самая любимая кукла . Люблю всех , но самая особенная для меня - Юта . Девочки, какие у Вас восхитительные куклы ! Разрешите представить Хуаниту-Аниту 1996 года от Веры Шольц для Waltershäuser ! Я назвала её Александрой. Куколка необыкновенная красавица. У неё мягкие, натуральные, медового цвета волосы, глаза - хрусталь, очень нежный румянец на лице. Аутфит сшит качественно и со вкусом. Vero такая красавица и только одно фото ! Последний раз редактировалось Vero 01 апр 2011, 11:00, всего редактировалось 1 раз. Вероника, отличные фото! Замечательная девочка, очень красивая! Куколки у всех замечательные! Спасибо за открытие такой темки! Хотела вам свою девочку показать Правда в живую я еще ее сама не видела. Она я начала года живет в гостях в Питере (поехала не по тому адресу) и ждет , когда я ее заберу домой. Итак Виола-Вита от Веры Шольц! Последний раз редактировалось Marichka 31 мар 2011, 18:56, всего редактировалось 1 раз. Marichka вот это сюрприз ! Я аж дышать перестала !! А почему так долго то в гостях ! Неееет ,я бы не выдержала !! Mariann, жду с нетерпением домашние фото Binella II 1999 года...она такая душечка. Матильда, подскажи, пожалуйста, что это за хорошенькая барышня на четвёртой фотографии сверху ? Marichka, как прекрасна Ваша Виола-Вита!